While I have respected and admired many people, I have stood in awe of very few. It is, perhaps, a flaw in my character, but I have not had many heroes, even as a small child. It is not in my nature to venerate people. About six weeks ago I read a book about a man whose life story is so exceptional that it seemed to me he belonged in the Olympic pantheon. What’s more, I was to meet him at his home right here in New Albany. I had never heard of the man before learning of the book. After reading the biography, parts of it several times, I was more than a little apprehensive about meeting him. I was, much to my surprise, in awe. The name of the book is Cactus Jack: Against All Odds. “Our school won’t be able to hire a cripple,” he said. “Well, that’s okay,” I said and drove off. Jack Carlisle was born in Monroe County, Mississippi, on September 23, 1929, a month before the Black Monday stock market crash of 1929. His childhood was very tough, even more so than most poor children who grew up in those tough years of the Great Depression. At age 16, Jack was horribly injured in an accident. His doctors did not expect him to survive. But, as became his habit, he defied the odds. He spent six months in a Memphis hospital and was finally released — his right leg amputated just below the hip. He had a lot of thinking time during that half-year. As he thought about his future, he decided he would become a football coach; a one-legged guy, who thought he could become a football coach! Those who knew and loved him urged him to find a more realistic plan. Cactus Jack did become a football coach, a very successful one, coaching high school and college football in Mississippi, Louisiana and Tennessee for 62 years. His high school record is 262-70-17. 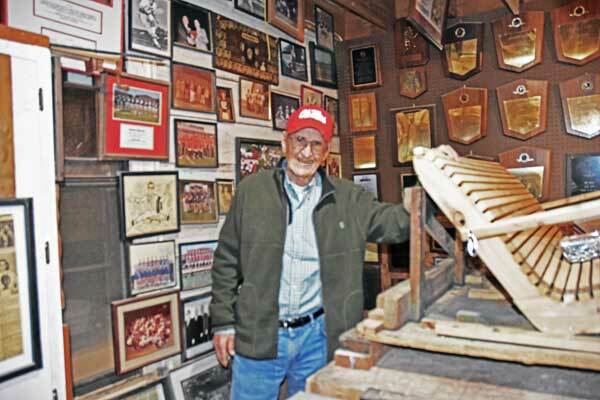 Jack Carlisle in his woodworking shop, where many of the awards he has received are displayed. That’s all I will tell you here about Jack Carlisle’s coaching career. But there’s another thing about him, something you would never expect in a tough, highly successful football coach: Cactus Jack Carlisle is a very serious historian. 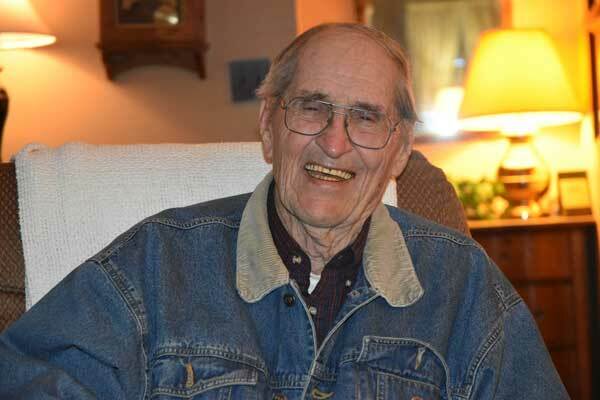 Besides coaching, he taught history in high schools and colleges for six decades. He has dozens and dozens of trophies, plaques, keys to cities, etc. from his coaching career, but he may value his personal library, thousands of books, as much as he does the trophies. His detailed grasp of history is as impressive as is his recall of names, plays, and scores of football games played 60 years ago. While my apprehension about meeting Jack Carlisle was justified, he made me comfortable the instant I met him. He is warm, articulate, funny — a very accomplished raconteur. I will stop short of calling Jack Carlisle a hero, but he may be the closest thing to a hero I have met face-to-face. Cactus Jack: Against All Odds was written by Jack’s son-in-law, Walter Hubbard. Hubbard and his wife, Jane, have lived in New Albany for several years, with Jack and his wife, Jean, living next door for the past three years. The book is very well written, making good use of Jack’s humor and of his knowledge of history and human nature. Woven through the book are pertinent, often touching testimonials from some of the many students, athletes and co-workers whose lives were touched by Jack Carlisle. The book is an entertaining, enlightening primer on the subject of what is required of one who seeks to overcome all odds and achieve success in any arena. Jack Carlisle, January 2018, in his New Albany living room. Buy and read Cactus Jack: Against All Odds. It is available on-line at the Amazon and Barnes and Noble websites. Cactus Jack Carlisle and Walter Hubbard are scheduled to be the program for the March 2018 “Museum Moments” at the Union County Heritage Museum. Copies of the book will be available soon in the museum’s gift shop. Thank you Jerry for sharing about this Great American who lives in our hometown. I have read this inspirational book and hope to meet Coach Carlisle someday soon.